HomeCompany NewsCongratulations to the Winners! Bluebelt’s SECOND Next Top Token to be Listed: Basic Attention Token (BAT)! The second round of the Bluebelt’s Next Top Token Voting Event has been concluded! The winner of the Second Round Vote to List: Basic Attention Token! BAT (token symbol) has been awarded a listing placement on Bluebelt Exchange. After we finish our BAT wallet integration, we will list BAT and pair it against USD, EUR, JPY, and some local minor fiat currencies as IDR, PHP, VND, etc. We would like to thank each and everyone who participated in the voting event. The participation for this second round is 50% more than the first round, which is great because more and more of our community members win BBXC tokens! The voters of the winning coin will receive additional 10 BBXC as a reward. We will distribute the BBXC tokens to voters on September 1, 2019. 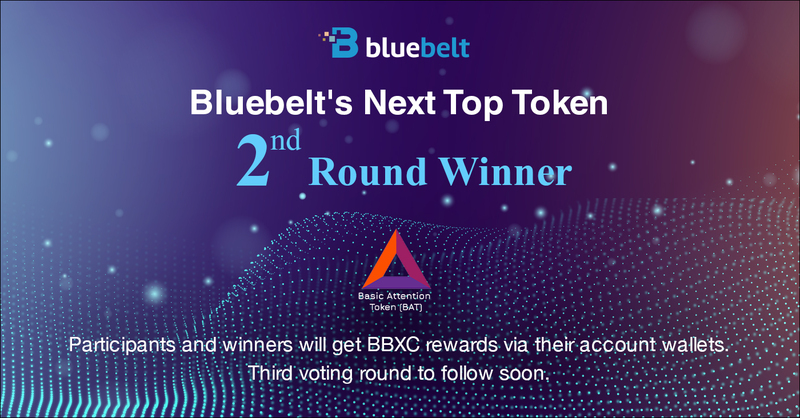 Please check the list below for the list of winners of the Second Round of Bluebelt’s Next Top Token Voting Event. The following users voted for other tokens but managed to acquire extra tokens anyway for referring more voters. Thank you for your participation and support and Congratulations to all our winners!